Hand-Eye Coordination | The Arts 25 | Style Weekly - Richmond, VA local news, arts, and events. Ashley Kistler roamed the world this summer looking at contemporary art. Her travels took her from trend-spotting international art events (Documenta in Kassel, Germany, and Italy's Venice Biennale) to Roanoke, where she presented a gallery talk. 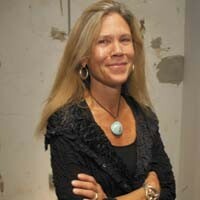 But she's had no qualms settling back home, where she's been curator at the Visual Arts Center of Richmond since 1999. "Richmond has been on the verge of a major arts explosion," she says. She cites the VCU School of the Arts, First Fridays, "and the amazing cultural activity in many places that's growing by leaps and bounds." Put the Visual Arts Center in the explosion column. It's become the anchor institution of an impressive gallery row on West Main and a major presenter of aggressive contemporary art exhibitions -- much of it under Kistler's direction. In December, the center will open its reconfigured and expanded facilities, including one-third more gallery space for exhibition programming. The opening exhibit of these gallery spaces will be an exhaustive survey of the work of Elizabeth King (see No. 24). Kistler also has a project in the works combining oral histories by VCU creative writing professor Laura Browder and photographs by Sascha Pflaeging  who divides his time between here and New York City  of women combat veterans of the Iraq conflict. Striving to offer exhibits that wouldn't be presented elsewhere, Kistler says, "I've tried to institute a balanced approach utilizing different media, different ways of making things and different ways of seeing. We're doing things that are national, international and local in scope. So, hopefully, we provide a different kind of experience every time you enter the gallery."